This is probably ground I have treaded through already, a time or two. Timothy Taylor had a post recently that reflected his typical level-headed and reasonable approach. In the post, he is defending the Fed's role in the crisis, as having plausibly prevented some version of another Great Depression. I think he is correct, as far as it goes. I would say that, while the Fed threw us a life preserver, it may happen to have been the one who pushed us off the boat. Over four years, home values pushed about 25% above the historical range, relative to GDP. Then, in three years, dropped by 50% to a point below the historical range, and have now recovered back to historically typical values. Theoretically, this should be coherent. Various arbitrage tendencies should work to keep rent and home prices growing at the general rate of inflation over time. The problem is that limits to housing expansion - largely regulatory in nature - cause prime real estate to be bid up, as incomes grow and the real housing stock stagnates. So, in practice, shelter inflation and comprehensive inflation have diverged. 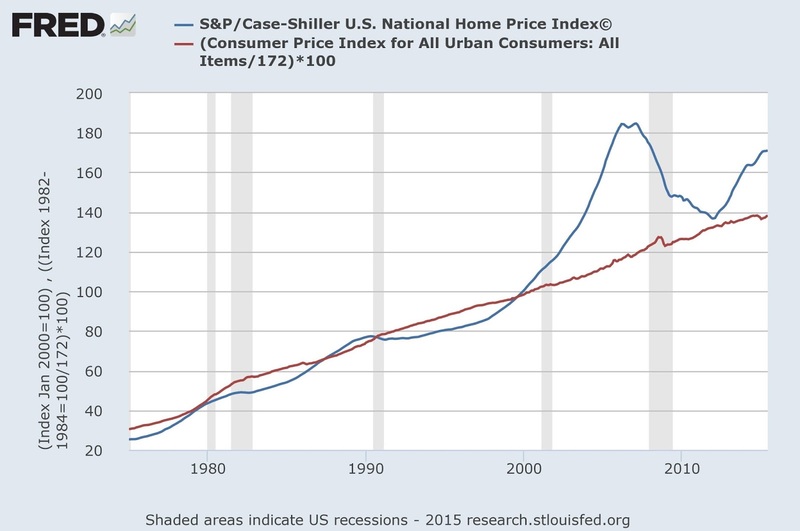 Given this divergence, it seems clear to me that the proper comparison is home prices and shelter inflation. In the next graph, I have added some additional measures to Taylor's graph, and I have indexed them to 1975 values instead of 2000 values. 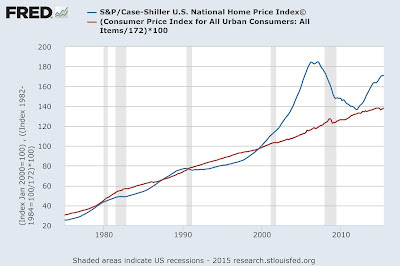 The blue line is the Case-Shiller national home price index. The dark green line is CPI inflation, the higher light green line is Shelter CPI inflation and the low medium green line is a very rough approximation of Core CPI excluding Shelter. The red line is average hourly earnings and the orange line is median household income. We can see that home prices are generally tracking with shelter inflation with a sharp rise above trend in the past 15 years. I think we need one more adjustment, which is to use a log scale, which in Taylor's defense is sometimes difficult in Fred. Here I have downloaded the data from Fred and charted it in log scale. There is still a bump in the 2000s, but the linear scale exaggerated recent proportions relative to previous levels. Also, this makes it easier to see how much the growth of price levels across the board have leveled off compared to the 1970s, and current home price levels don't look as far from the long-term rent trend as they do in the linear scale. Relative to rents indexed to 1975, home prices are about 15% above the rent trend level and are still about 30% below the relative top price levels of the mid 2000s. Even if we conclude that home price levels should be back to the trend measured by rent inflation (and I don't think we should, given low secular real long term interest rates and building constraints), we can see how monetary policy that led to 3-4% inflation, similar to the 1990s, would have been capable of helping to pull home prices back close to trend without creating a nominal crisis. This is basically what did happen in the early 1990s. We seem to have come to a consensus that stability is not a universally applicable policy goal. Looking back at the previous graph, I think we can see the effect the housing constriction has had on real incomes. Median real incomes and wages have grown somewhat over the past 30 years, but rising rents have eaten up the real growth. So, if we adjust nominal incomes with CPI, median real incomes look stagnant, but if we adjust with CPI ex. Shelter, there has been some growth. Given that there has been some additional growth among high income labor, the use of more aggressive inflation adjustments exaggerates the amount of inequality. And, I think that is the proper way to describe this. Given that shelter expenditures have been level for about 40 years, in nominal terms (as a proportion of total spending), but real shelter expenditures have fallen sharply, it appears that, in the aggregate, the elasticity of demand for housing is roughly unitary. Considering the wide range of housing investment over this time, and the substantial drop in real housing consumption (as a proportion of total spending), the trend of nominal shelter expenditures running flat for the period at about 18% of total PCE is striking. This suggests that the excess inflation related to shelter is related to supply, not monetary policy, and that we might be better off conceiving of real adjustments to income by using CPI ex. Shelter. The additional real income that goes toward bidding up the shrinking relative housing stock is a consumption choice. Of course, the aggregates hide a lot of individual idiosyncrasies. The constraints on housing create a lot of movement within the economy as households realign themselves with changing reality. We can see this in dramatic fashion in the most constrained cities where longstanding tenants complain about gentrification and rising rents. The problem is sharp enough that it has begun to define political movements. Normally, a family who are long-term tenants in a house gather consumer surplus from their extended tenure. The value they receive from the property increases as their relationship with the local community deepens. When developers purchase entire neighborhoods for new development, we can see this play out when some households refuse to sell their properties, even at values well above market rates. Those values don't reach their substantial level of consumer surplus. In the cities today, we are seeing the opposite. Rents have risen so high because of supply constraints that market rates have risen above the level of consumer surplus gained by longstanding residents. They are being forced out of neighborhoods that, to their senses, have not changed. Rent as a proportion of income in these neighborhoods has increased over time, to a point that is no longer sustainable. The problem is that this problem has festered for so long that if the cities with those neighborhoods did allow supply to grow, there would still be a long period of adjustment before rents declined enough for the influx of households would reflect the socio-economic norms of the long-term residents. So, those residents fight new supply, because it appears to only worsen their situation, because they associate the new housing units with rising rents. But, these residents are only one side of the coin. Many families, faced with the supply constraints of the high rent areas choose to move to lower cost cities. This movement aligns costs with incomes, but gets lost in aggregate numbers. State-level cost of living adjustments raise the level of measured poverty in places like California, New York, and Washington, DC. At the top of the income distribution, households are bidding up rents in order to gain access to high income labor markets. At the bottom of the income distribution, households accept a high cost of living until they can't manage to any more, and then move to lower cost areas. (Actually, even relatively high income households are being forced out of the worst cities.) There is probably a bifurcation of individual outcomes here. High income households moving into these cities claim a higher portion of compensation because of the limited access to those markets. Relative to aggregate measures, low income households who lived in those cities but moved should tend to have seen higher real income growth than their raw incomes would suggest due to their reduced cost of living. Low income households who have remained in those cities should tend to have seen lower real income growth due to the excess increase in their cost of living. In the meantime, regarding the labor/capital split, higher rents (and imputed rents to homeowners) would cause capital income to rise, and for measures that include capital gains, the associated rise in real estate values would also cause capital incomes to rise, and would create very large reported incomes for households who have sold a property. This graph, from some recent work by Josh Bivens and Lawrence Mishel at Economic Policy Institute, does a great job of helping to consider the different aspects of recent wage divergence. The top line estimates the growth in productivity since 1973 and the bottom line estimates the growth in real median compensation. I am not going to try to engage in detailed statistics here. There has been a lot of conversation about this graph, and I think others have debated the details well. But, I would like to conceptually consider the effect of a supply constraint on these numbers. The difference between the top line and the next line is the amount of marginal production since 1973 claimed by capital as opposed to labor. Labor has seen a growth of 63% in real compensation while productivity has risen by 72%. This next graph estimates the portion of domestic income captured by residential real estate owners, after depreciation and expenses. This reached a low point in the mid 1970s Since then, it has grown from about 3% of GDI to about 5% of GDI. I estimate that this accounts for roughly half of the difference between compensation and productivity growth. Note that most wage-earners are homeowners, households are divided between those who are simply earning rents on the supply constraint outside measured wages and those who must pay rents to a landlord. But, in any case, this has more to do with land-use policies than it does with the distribution of productive output or the negotiating power balance between workers and employers. If we use price measures as a proxy for demand-side inflation, but the shelter component is the result of a supply issue, then using an inflation proxy that includes shelter inflation is double counting, I think. Housing is unique in this way, in that the marginal cost from inflating rent goes to land, which is fixed in quantity. If inflation is high because bananas have been especially costly over time, this is mostly a reflection of higher costs, and would be embedded in a net of opportunity costs and tradeoffs that would be difficult to disentwine from monetary inflation. But, the consistency of nominal housing expenditures, and the inevitable capture of excess expenditures by land owners as unusual capital income, means that this sort of inflation reflects the transfer of income to rentiers instead of costs. (The existence of natural arbitrage tendencies that would tether long term home values to general inflation levels seems to be generally accepted, leading to the use of CPI inflation as a trend input for home prices, as Timothy Taylor did in the post that started me off here. But, oddly, this assumption is used in spite of the clear divergence of shelter inflation from general inflation. This seems to lead to demand-side arguments about housing bubbles, whereas it seems to me that the acknowledgement of this long term divergence should lead us to supply-side explanations. In other words, it seems that almost everyone models home prices as if that arbitrage has happened without bothering to notice that it hasn't. We should all be in agreement that that arbitrage should happen. Cutting off housing supply through credit and monetary tightening is just making matters worse.) If we agree that the increased rents reflect a transfer of economic rents from tenants to landlords, then I think we must agree that the excess shelter inflation reflects this transfer rather than a change in the relative value of the dollar. That being the case, I think that some of the "Terms of Trade" gap is due to a flawed inflation measurement. And, I think, even within the "Inequality of Compensation" gap, some will be explained by the rents that are captured by high productivity workers who live in the housing constrained cities and by the various movements in and out of those cities as workers align their income potential with the cost of living in various locations. If a worker making $150,000 in Austin can move to San Francisco and make $200,000, but they have $25,000 additional rent expense, then their real income has only increased by $25,000, not $50,000. Using nationally aggregated inflation adjustments will exaggerate the level of income inequality in this case. As Hsieh and Moretti point out, both the $25,000 in additional rent and some of the rest of the additional $25,000 in income can be attributed to the effect of housing constraints on incomes and rents in San Francisco, so there are several subtle ways that this problem leads to more income inequality as it is generally measured. This effect is far too complicated for me to estimate here. At the risk of being that guy that's always obsessing about housing, I agree with those who note that this is much more of a wage distribution story than a wage vs. profit story, and I think a good portion of these wage distribution issues are related to housing. "Even if we conclude that home price levels should be back to the trend measured by rent inflation (and I don't think we should, given low secular real long term interest rates and building constraints), we can see how monetary policy that led to 3-4% inflation, similar to the 1990s, would have been capable of helping to pull home prices back close to trend without creating a nominal crisis. This is basically what did happen in the early 1990s. We seem to have come to a consensus that stability is not a universally applicable policy goal." That is basically my position. I think it is important to disaggregate home prices into: Price/Rent x Rent. My position is that Price/Rent was roughly in line with long term real bond rates. Those rates were low in the 2000s, so there was a natural increase in prices. At the same time, the supply constraints of the major metro areas were pushing up rents. This is a separate issue from Price/Rent changes. I divide the nominal change in home prices from the mid-90s to the mid-2000s roughly in thirds: 1/3 from falling Real Yields, 1/3 from rising Rents, and 1/3 from rising expectations about future rent inflation. To solve the rent problem, we needed more houses. Some of the problem could be solved by allowing credit to continue to expand, but much of that problem probably must me solved at the local level (NY, San Fran., etc.) Tightening the money supply as a reaction to the housing boom simply made matters worse. First, housing starts collapsed in 2006, which led to sharp increases in rent inflation, so rising interest rates led to a lower Price/Rent, but undercutting supply led to rising rent and rent expectations. And, when the Fed refused to relent, eventually credit markets broke down so much that the housing market collapsed. When home prices collapsed, it was an unprecedented divergence in the relationship between yields and Price/Rent - a collapse of equilibrium markets. Now, rent is just about the only part of expenditures that is feeding inflation because the whole crisis has only made the constriction of housing supply worse. Home prices still have not risen back into convergence with long term yields on real bonds. I think this even plays out in the long term yields issue. The reason there is a glut of savings in the bond markets is because there is about $25 trillion in missing real estate capital value. One of my main points of reference going forward is that if and when we allow a full recovery in the housing market, bond rates will rise - as a result of having outlets for savings in real estate development. Both home equity and mortgage investments are relative substitutes for treasuries. The loss of real estate capital (in both physical and nominal terms) has more than compensated for (in a negative way) the addition of treasuries from deficits. So many people say we should run larger deficits to soak up that savings. I think it is obvious that the more functional thing to do would be to facilitate the movement of that savings into real estate that is clearly undersupplied and has been for 20 years. I think we could go so far as to say that loose monetary policy today, if it was accompanied by access to real estate purchase by middle class households (a functional mortgage market and positive monetary influence on home prices and home equity positions) would not be especially inflationary. Because one large effect would be the recovery of homebuilding, which would have a deflationary effect on rent, and if we take rent out of the inflation indicators, inflation is running at around 1%. Now core CPI is 3% rent inflation + 1% other = 1.7% total. I think accommodation could lead to 0% rent inflation + 3% other = 2% total. The elephant in the room that everyone is scared to notice because of the fears from the 2000s is that housing has been decimated. This is a huge source of real investment and consumption growth that has been dead in the water. If housing is unleashed, there is very little risk of a loose monetary stance right now. Money hasn't been too loose since 1980.